Netherlands all-rounder Sterre Kalis has been rewarded with the prestigious Tasmanian Cricketer of the Year accolade. The 18 year-old from the University of Tasmania CC has claimed the Kim Fazackerley Medal for the current season with 18 votes. Playing her debut season in the CTPL, she scored 456 runs at an impressive average of 76.00 and also claimed 11 wickets at just 15.00. She top scored with an unbeaten 132 against Glenorchy Cricket Club to clinch the award. Kalis was part of the ICC Associates Rookie Programme this year, being part of the Sydney Thunder squad in the Big Bash League. 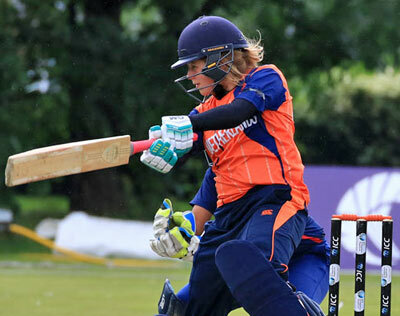 Kalis played a key role for The Netherlands as they qualified from the European Women's T20 competition in Scotland last season scoring 88 and 48. She has also played for Essex as well as The Netherlands and will have a major role to play as the Dutch hosts the Women's T20 World Cup Qualifiers this July.